Borg Locks will be exhibiting their Easi-code Pro range including the new BL2501 which features their patented 'On the door' code change system, which allows you to fully update and change codes without the hassle of removing any pins or tumblers. This model is fully reversible and is suitable for all light to medium duty doors. This has been cycle tested over 100k+ times to ensure each model works as intended and is available in both holdback and non-holdback. One of the largest security breaches ever has come to light today as Equifax revealed attackers used an exploit on its website to access records for 143 million US citizens (for reference, the US has a population for 323 million or so, that's about 44 percent). From Midas Touch. Padlock size and being keyless, makes it ideal for backpacks and travellers. Good item to stock in the shop. Robert Jones has joined Vanderbilt Industries as Area Sales Manager for Ireland. Hundreds of LockState smart locks around the world stopped working after the company mistakenly issued the wrong over-the-air (OTA) software update for the devices, according to Ars Technica. Home and commercial security company UAP has unveiled plans for a six-figure investment to increase brand awareness. The Greater Manchester-based firm is spending around £550k on a new campaign that will include a series of nationwide TV and radio adverts during the next 12 months. Sean Wilson, the man behind Coronation Street character Martin Platt, features in the UAP adverts currently airing across 200 TV channels and more than 30 radio stations. When August Home raised its last big round nearly two and half years ago, the smart lock maker was targeting retail expansion. Developed by the National Police Chiefs' Council Security Systems Group, the guide provides an overview of the impact that false alarms have and offers recommendations on how installers can help to reduce these. It sits inside a sprawling, aged industrial building under the Van Horne-Rosemont overpass in Montreal, and is probably the last place you would expect to find one of the most unusual museums in the city. The Aaron M. Fish Lock Museum and Educational Centre wouldn't be out of place in some chichi downtown location, but its builder and curator, Aaron M. Fish, sought a location close to where he grew up and has spent much of his working life. Boon Edam Inc will be emphasizing integrated access control solutions that both authenticate authorized passage and prevent tailgating in Booth #4003 at the 63rd ASIS International Seminar and Exhibits in Dallas, Texas from September 26th-28th. The manufacturer is also the official Turnstile Sponsor for the Exhibition. A children's hospital is benefitting from enhanced new levels of security thanks to the installation of an IP video entry system from Comelit. The ViP system at Sheffield Children's hospital has been integrated with the hospital's existing unified Cisco infrastructure network. As part of a £40 million redevelopment, the advanced Comelit video entry and access control system has been installed in a new section of the hospital, which is home to a new outpatients' department and three wards, featuring more single rooms with en-suite facilities for parents staying with their children. The new building also includes priority car parking, a main reception area, an iconic play tower and an inner courtyard play area. A "category one" cyber-attack, the most serious tier possible, will happen "sometime in the next few years", a director of the National Cybersecurity Centrehas warned. According to the agency, which reports to GCHQ and has responsibly for ensuring the UK's information security, a category one cybersecurity incident requires a national government response. In the year since the agency was founded, it has covered 500 incidents, according to Ian Levy, the technical director, as well as 470 category three incidents and 30 category two, including the WannaCry ransomworm that took down IT in multiple NHS trusts and bodies. Dahua Technology UK and Ireland is giving security professionals the opportunity to experience first-hand some of the world's most ground-breaking technology - in a brand-new format. The Technology Showcase events, to be held across the UK during October and November 2017, will consist of eight 'zones' featuring fully interactive, hands-on demonstrations of the company's products and systems, including artificial intelligence, thermal hybrid technology, Starlight low-light cameras, video analytics and 4K CVI. Y-cam Solutions, a leader in smart home security since 2007, announces Y-cam Skill enabling Alexa control of Protect, a complete Triple Layer smart security system designed to actively monitor your home and reduce your chances of becoming a victim of burglary. Simple to set up, the Y-cam Skill provides greater control using voice activation to manage your Smart Home Security. Allegion UK will showcase its flagship SimonsVoss MobileKey system at Europe's largest exhibition trade show for locksmithing and security, the MLA Expo, in Telford from 6th-8th October. Visitors to D&E Architectural Hardware on stand No. 170 will be invited to attempt to open a box locked with the Geminy product. Anyone successful in opening the GEMINY product within the allotted time, using ONLY the tools provided, keeps the £500.00 cash inside. The Drumm Geminy, is a unique security product available in the UK exclusively from D&E. His planned "loo break" was part of a movie-style plot to stage one of Britain's biggest cash thefts, a court heard yesterday. Ranjeev Singh deliberately lingered outside the lavatory while his fellow guard Mohammad Siddique drove off with the money. Taking place October 6th-8th in Telford, MLA Expo will feature a significant amount of training open to MLA members as well as non-members. Whilst details are subject to change, initial information shows Courses/Seminars offered will be offered in the areas of General Locksmithing (to include non-destructive entry, Lock ID, UPVC related training, High security cylinders, abrasive wheel certification, tool sharpening an overview of the BLI exam, auto gates), as well as Safes. Chris Belcher passed away on the 4th August. 'Chris, one of the best-known, and well-liked locksmiths in the UK, had suffered a 6-month battle with lung cancer, but passed away with his dignity, with his charm, with his sanity, in his own bed with his family around him', writes Suzzie Belcher. 'If you wish to read more about the cancer journey that he took, please read this page www.facebook.com and if you wish, you are welcome to contribute to the MacMillan Tribute Fund which I promised him that I would do. 'Without the help and support of the MacMillan Nurses I don't know how I would have managed. 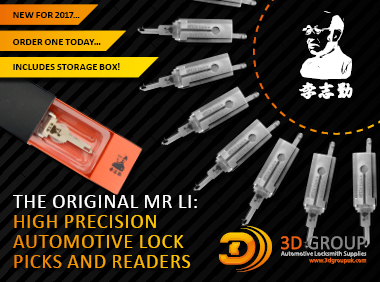 MLA Expo 2017 is fast approaching - Europe's Largest Locksmith & Security Exhibition. Taking place at the Telford International Centre, the event will span the course of 3 days, from 6th - 8th October 2017. This year we have exhibitors/visitors from all across the globe. The price of copper has increased by over 50% in little more than year, raising fears that when metal prices rise, so will the incidence of metal and cable theft. In the last four months alone, the value of copper rose 25% to $6800 per tonne on 29th August, according to the London Metal Exchange. Since its low point in 2016, when it was just $4310 per tonne, the overall increase is over 50%.